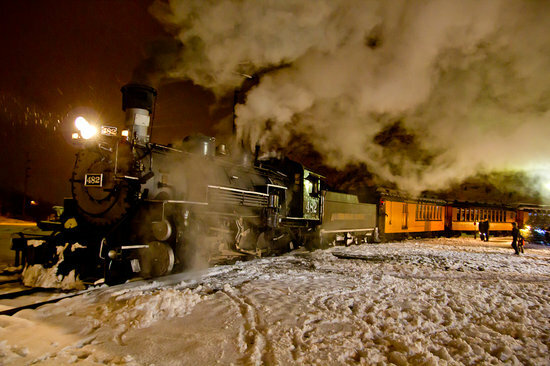 All aboard the 2015 Durango Silverton Polar Express. With the holiday’s fast approaching, families are searching for the perfect way to come together and enjoy the season. Durango and Silverton Narrow Gauge Railroad offers the perfect family winter experience with its annual Polar Express Train Ride. It’s time to bundle up, come aboard and relish in a magical evening of fun and fiction. Put on your pajamas and prepare to be awestruck as your train travels through the snow covered mountains. Chris Van Allsburg’s award winning book comes to life as you’re treated to hot chocolate while your personal chef reads the classic tale. You arrive at the North Pole where you pick up Santa who travels from car to car speaking to all the children. When it’s not your time with the big man you can enjoy singing specially selected Christmas carols while your train makes its return trip to Durango. Selected as one of the top Polar Express Train Rides by Fox News, it’s sure to create lasting memories for the whole family. Tickets go quickly so decide which experience best suites your family and book soon. -Deluxe – seats feature ‘flip over’ seats that allow families to face each other and also come with a souvenir ceramic mug to commemorate the experience. -First Class – features table and chair seating in a special ‘themed’ Christmas decor first class car and also includes a souvenir mug. Adult fares are for ages 12 and over and range from $32-$75 based on date. Children are classified as 2-11 and range anywhere from $22-$65. Children under 2 not occupying a seat ride for free. All tickets are subject to a 7% historic preservation fee. The train runs from November 21st, 2015 – January 2nd, 2016. Scheduled departure times start at 5:15 p.m., 6:50 p.m. and 8:25 p.m.
Durango is an amazing place to be during the holiday season. Book your room today at the Quality Inn Durango and enjoy the local trolley from our door step right to the train depot. All aboard!